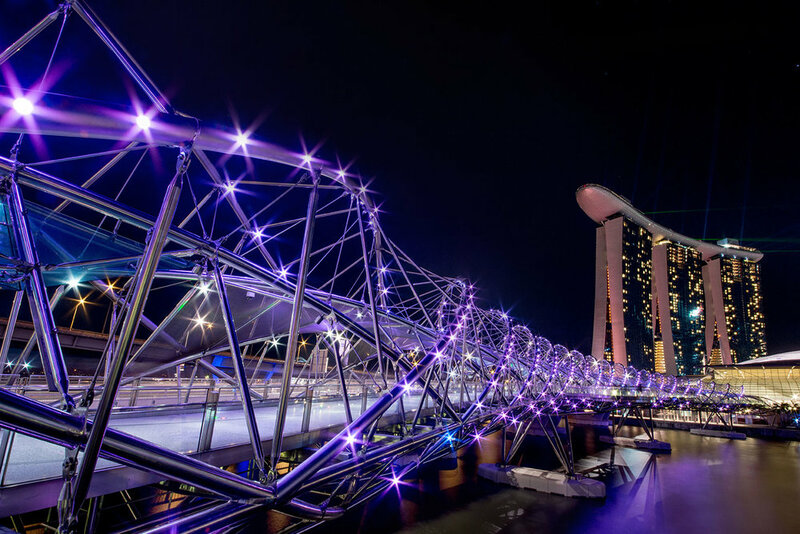 Commonly referred as Helix Bridge, The Helix is associated with a double helix DNA structure to symbolise “life and continuity, renewal and growth”. It is made of a special duplex stainless steel that equips it with high structural strength, reducing maintenance needs and is able to support up to 16,000 people at a time. The Helix is designed by Cox Group (Philips Cox), Arup (both from Australia) and Architects61 from Singapore, intended to link the “necklace” of attractions around the Marina Bay. A walk along the Helix bridge offers impressive views of the city skyline. A series of ovular-shaped cantilevered viewing ‘pods’ extends out for optimised experience. At night, the bridge is lit which brings attention to the double helix structure, creating a special visual experience to pedestrians. The Helix is a 1 minute walk along the Marina Bay Waterfront Promenade from ArtScience Museum.